Escape the Isle of Crete on wings made of wax. 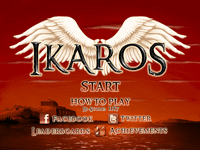 Control IKAROS (better known today as Icarus) to run and fly your way to safety while collecting treasures. The goal is to run and fly as far as you can without falling in the water. Touch anywhere to flap your wings. Hold your finger down to fly a little higher. You may flap 3 times before landing. Gather coins and gems to raise your Flight Meter. Fill the Flight Meter to earn a brief Speed Boost. During a Speed Boost, you may flap as much as you like. Dynamic terrain: never play the same game twice!